Luke Nelson made quite the entrance to the professional ranks in 2013. 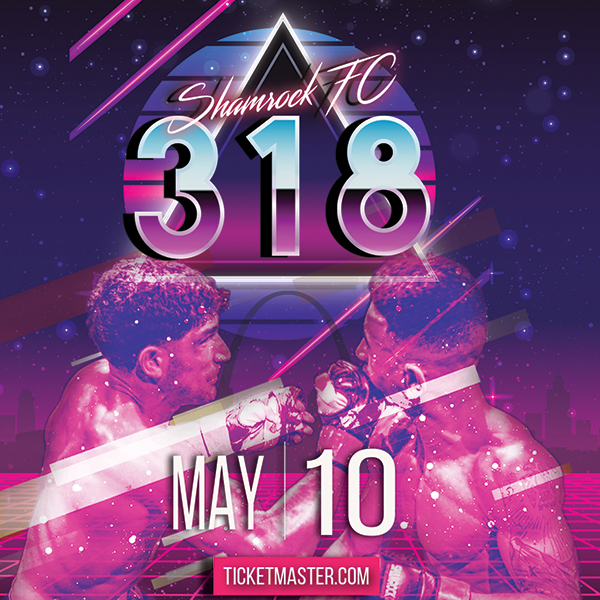 In December of that year, Nelson made his pro debut against Kain Royer at Shamrock FC: Invisible with a memorable first-round TKO win. With plenty of promise and potential, Nelson pretty much fell off the MMA map following the Royer victory. He went 1-1 in 2014, with his only win coming against Marquez Jackson. Nelson (2-2) fought, in MMA, just one time since 2014, a decision loss to Enrique Gonzalez in September 2016 at RFA 44 here in St. Louis. 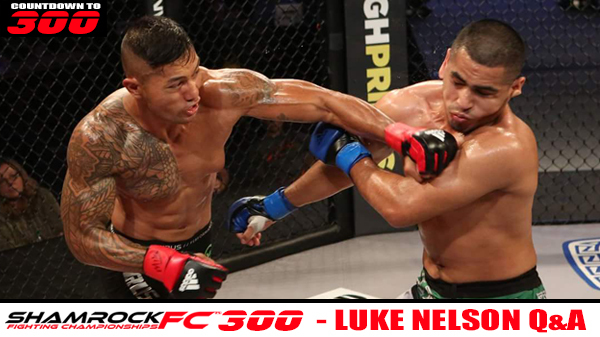 On Friday at SFC: 300 at the River City Casino, Nelson is back with a tall order in front of him when he faces Rashard Lovelace in a lightweight showdown. Lovelace was the 2016 STL MMA Regional Fighter of the Year. He won his first four pro fights, all via TKO in the first or second round. After taking nearly a year off, Lovelace (4-1) suffered his first pro loss earlier this year when Sean Woodson bettered him in June via unanimous decision. David Cormier sat down with Nelson to talk SFC: 300 and his martial arts journey. When did you begin training in combat sports and in what context? LN: I was in the Marine Corps. At the time, I was getting into the Marine Corps martial arts program as an instructor and my staff sergeants, who considered the Marine Corps martial arts training program as a base, a foundation, wanted us to experience other martial arts. They really pushed this idea, exploring other disciplines. So being a Marine Corps martial arts instructor was my start. So, on my time off, while in the Marine Corps stationed in California, if you've ever been to California it is like the Mecca of fighting sports, one of them anyway, every other half mile there's a gym. I started training Muay Thai there. And pretty much stuck with Muay Thai for a very long time. I dabbled in some jiu-jitsu, but I didn't fall in love with jiu-jitsu. I fell in love with Muay Thai. So, I definitely focused mainly on Muay Thai as I explored martial arts beyond the Marine Corps program. When I left the Marine Corps, I took off for Thailand or a month. There, I trained twice a day for six days a week. I lived the Thai style. Can you talk about your experience as a Marine? Did you serve overseas? I did three tours. Two tours in Iraq, Kuwait, and the last one was on float, on ship, doing antiterrorism missions within the Persian Gulf. What were some of your roles on your tours of duty? Yeah man, on my first tour we were in Ramadi, I was an infantryman all the way through my career, so I was a door kicker. Our jobs are numbered, I was an O-311, which is a rifleman, so like doing close quarters stuff, Call of Duty stuff, going house to house, that's what we were doing, hunting down bad guys. On my second tour, we were doing the same thing, but I was a squad leader, so I had thirteen other people, thirteen other lives I had to manage. We were pretty much-doing antiterrorism stuff, all the way through my Marine Corps career. I started from the bottom and moved up to a leadership position, but no matter what, our main job was always hunting down bad guys. You've fought in MMA, boxing and Muay Thai events. Muay Thai is your preferred. Why? I love the art of it. It is not just two guys beating the crap out of each other. There's an art to it. There's a finesse to it. When you watch living legends like Saenchai and Buakaw (Banchamek), those guys put a finesse into the art. When you watch Muay Thai, when you see these legends fight, executing movements, you're like "That was amazing." There is just that aura about it. That aura drew me to Muay Thai. I wanted to be like those guys. And I still do. I got to meet Saenchai in person. I got to watch him train. Just watching it live, it made me want to do it more. Muay Thai is definitely the art and discipline I prefer, and it is a great fighting sport. And, the fact that you have so many weapons at your disposal, and how creative you can be. It is like you are an artist painting a picture, you know you can paint it, however, you want. That is your masterpiece. That is your artwork. That draws me into Muay Thai. And boxing, I love boxing. I am Filipino. We love fighting sports. It is in our blood. And boxing is one of the main fighting sports in the Philippines. Guys like Manny Pacquiao, just watching him, those are the fighters you want to be like. I love boxing. I worked on my boxing a lot and have been trying to improve that. So yeah, Muay Thai and boxing, they are definitely my favorite. I like to stand, and I like to throw. When it comes to combat sports what do you excel at beyond the competition and what advantage does that give you? I think mixing it up. I think especially my close game, the clinch game, within that range, the elbows and knees, I think that definitely is my preferred situation. Getting in there and mixing it up in that range, with the elbows and knees, that is it. It gives me the advantage because a lot of people don't train that range. A lot of people don't understand that range, they don't understand the grind it takes to be in the clinch, it is a game changer, and a lot of people don't work that. A lot of people will just work boxing, or they'll kick and stay on the outside, but what happens when that distance closes and you can't kick, and you can't throw big punches from the outside? That Muay Thai style where you can go from long range to short range to middle range and back is a huge advantage for me. Especially knowing how to use those weapons, the knees, the elbows, in close and then utilize punches and kicks outside, knowing how and when to use all of the weapons, I think that is a big advantage for me. You coach Muay Thai at Watson Martial Arts, how has coaching impacted your approach to training and to fighting? It gives a different perspective. Because a lot of times you learn from your students, you give them a technique, and then you learn from them. Sometimes they just happen to do something you've never seen before. And it is like "Aww man, maybe we should try to perfect that and see what happens." It shows me what I need to work on too. Watching them, the younger guys, you see that you get caught doing that too, making those mistakes, and then we resolve it, and we all learn. It helps me understand what needs to happen in training and what needs to happen in fighting. Being an instructor shows you the discipline needed to win and what it takes to get to where you want to be in your fighting and in your training. Sometimes you'll meet guys who are super gung-ho but they have distractions, outside the gym or they have distractions inside the gym, and that brings me back down to reality, shows me why it is important to stay focused, keep your nose to the grindstone, your eyes on the prize, on the bigger goal. Because sometimes distractions can kill a fighter, like real quick, I think, and that is off the mat. You need to stay disciplined. Being an instructor helps with all of that. When you coach you put a lot of emphasis on technique, do you consider yourself a technician or a brawler or both? What's the advantage of your approach? I definitely consider myself more of a technician when it comes to fighting. I think having technique beats guys that just want to come in and brawl it out. Having good technique allows you to sneak in strikes and finish a fight instead of just brawling it out and seeing what happens. Being a technician is very important. Brawling it out, I don't think that's the safe way to go. I like the technique of it. Once you have technique, you can elevate your level, and you start at the bottom, you perfect the basic techniques, then, man, you can start advancing your game. Without technique you stay at the bottom, you don't evolve. I believe that. I take that to heart. Once you stop evolving, something is wrong, and you need to fix something. Technique is very important to me. What do you really appreciate about combat sports? Several things. I think it is the competition. It is not that we are in there to beat the crap out of each other, we challenge ourselves and each other in there, to see what our limits are and push past them, to meet those challenges. And on top of that, it is a team sport, but it is individual too. That right there is really what does it for me. The challenge though, I mean why wouldn't you want to challenge yourself? If you don't challenge yourself, you don't know where to go from where you are. You never know if you need to improve on this aspect of your game or that aspect of your game. You get stuck in one spot. You plateau. Without challenging yourself, you don't learn about yourself. And I think it makes us stronger people. There is no lying in combat sports. When you're in there, you show heart and people recognize that it is obvious, people see you as a true warrior, win or lose, a true warrior, one who fought to the end. There is no lying in it. And I think that is what I love about combat sports. When it comes to combats sports, what are your biggest barriers and how do you overcome them? I think it is a couple of things (laughing). One is dieting. No one wants to cut weight. I love food. I can eat food for days. And coming from a Filipino background, if you've been around a Filipino family, we eat everything with rice man (laughing), so it is hard not to eat constantly. And I think overtraining is a big problem. You need to know when to slow it down and when to take it easy and listen to your body. I have a big issue with that. I like to train twice a day. Sometimes I don't listen to my body, and I pay for it. It is a matter of finding that fine line and not flirting with it. That is definitely a barrier. What are your short term and long term career plans within combat sports? Short term goal is definitely to get to a bigger promotion and start fighting on a bigger stage. And, getting better, you know, evolving, day in and day out. Long-term goal is to continue training no matter what even after I retire from fighting, I still want to keep training, and hopefully own my own gym. How do you expect the fight on Dec 1st to go? For sure. It is going to be a stand-up war. Me and Rashad we are known to be strikers, not to worry about the ground game too much, which is fine with me, I am more than happy to do that. When that bell rings, I am going to meet him in the center and see what happens. We are going to throw down, see who mixes it up better, it is my world versus his, you know, we will see who is the better striker, and I am all for that. I know it is going to be a war. But in a perfect world, you know I hate calling my shot, but like, but in a perfect world, I finish Rashad in the second. I think, you know, he obviously has weaknesses in his game that I see, and I am going to exploit them, and I am sure he thinks the same of me. But I know it is going to be a war. I am ready to go anywhere, anywhere this fight goes. I am going to be ready no matter what, and we are going to take the fight to each other. I am ready for it. I am excited for it actually. I see a great stand up battle. Super action packed. I don't see any lulls in this fight. I think a lot of people will be interested in this one. You won't want to miss it. It is going to be action-packed from start to finish.